How does your dog travel? The picture above (left) was taken from my car a few weeks ago. People scare me to death when they travel this way with dogs but I know a lot of dogs love it and a lot of dog lovers travel this way. It may be better than making the pooch stay home. This rottie was all over the truck but after watching him for a few minutes I saw him more as a pick-up surfer than a hapless rider. He knew how to move with the truck and there was no doubt he was having a good time. My own dogs (on the right) probably aren’t a whole lot safer. This was the day of the rabies clinic in town, one of the very few events we all travel to together. I had strapped Panama into a car seat in the back, knowing that he’d behave but also knowing that he wouldn’t be likely to share a seat. The three little ones were sitting nicely in the front car seat until Skidget (who was not hooked into a seat) jumped in with them. Well, who could blame her. It is “her seat” after all. Most dogs love to ride in the car. Of the 6 dogs who currently make up my household only Dixie doesn’t love riding in the car. I think it has to do with their early travel experience and how well you plan it for them (or don’t plan it at all) as well as their own individual temperament. Whatever it is, as in most situations with dogs, it can be modified at least to some extent. The first time I remember thinking about dogs in cars was when my beloved Pooh, my first poodle, was with me. He liked to stand on the seat and look out the window but at 12 pounds he could topple if I took a corner too fast or hit the brakes. I was surprised to find an actual dog seat in a thrift store back around 1989 (in the pre-Internet dark-ages). I didn’t know that there was such a thing. He used that seat for the rest of his life and he loved it from the very first time. The dog’s safety isn’t the only reason to consider securing your dog in the car. A cop who saw my car seat once told me what a good idea it was because if I were in a wreck they could get to me without dealing with the dog. I’d never thought of that but it makes sense. Many dogs, he told me, won’t let rescue workers near the accident victim which can be a real problem. 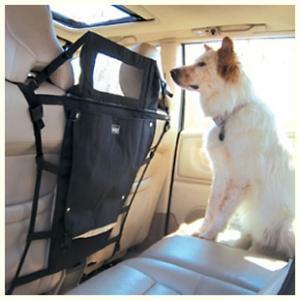 It’s a good reason to secure your large dog even if he just sits quietly on the seat when you travel. Little dogs can cause other types of danger. If left untethered they can be under your feet in the blink of an eye and interfering with your ability to drive. We’ve tried a lot of different types of car seats and I like some better than others. For a long time we used a “milk carton” seat. The seat belt could slip through the openings in the carton and a pillow in the bottom made it a good seat. Panama liked being up a little higher so I put a single drawer under the seat that held water, leashes, paper towels a disposable bowl and poop bags. That lifted him up and contained anything we might need if a short ride turned into a long outing. The best thing about this seat (aside from price) is that it is deeper than a lot of the little seats now sold for dogs. Even though they are tethered by their harness in most seats they would fly over the edge of some and be left hanging by the harness. Of the seats currently on the market our favorite is by “Solvit”. Outward Hound (makers of a lot of good dog items) makes a similar one that I don’t like because it has a strap that goes from the front of the seat around the auto seat’s headrest and that strap tends to get in the way. The Outward Hound also tends to sag and try to sit flat on the car seat. 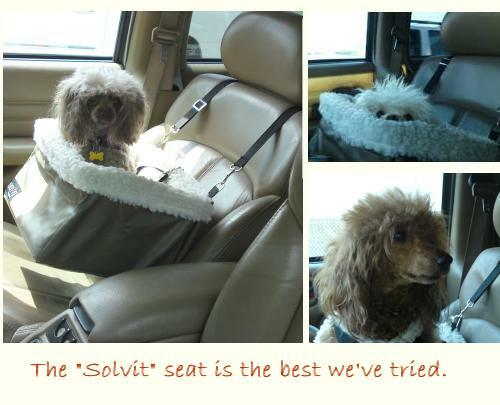 The Solvit seat is built so that it stays up off the seat allowing your little pooch a good view. The price varies but it’s reasonable. (Try Ebay. I found some there for about $26. ) There are a couple of sizes. We have the small one that says it holds up to 12 pounds although Panama is a little heftier than that now. We have tried using barriers and letting all the dogs travel in the way-back. That didn’t work very well for me. It doesn’t really secure the dogs it just keeps them in the back – if it works. Ours had spaces that were too big and the dogs climbed through them. (Great planning on my part.) I just discovered this new barrier that looks interesting if you just want to keep the dog(s) out of the front seat. This is the Kurgo Pet Barrier and can be found on Ebay for around $43 (including shipping). Please let me know if you try this one. It looks like it might be a good one. This entry was posted on Monday, February 1st, 2010 at 4:54 pm	and is filed under Travel. You can follow any responses to this entry through the RSS 2.0 feed. You can leave a response, or trackback from your own site.